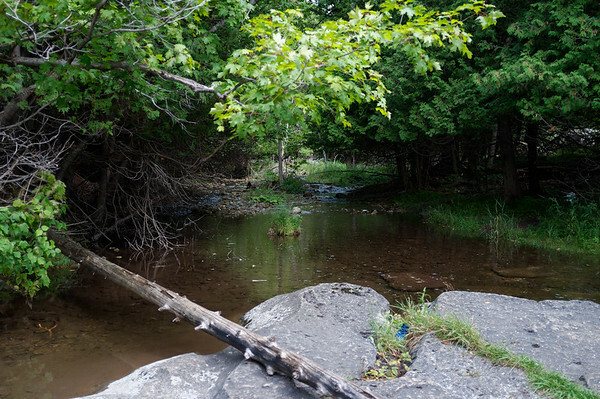 Last time, it was very hot and humid and our water shortage left us needing to take a short cut to the parking lot so we made our way back to the waterfalls, climbed over the wall and hopped across the water and got back on the trail. 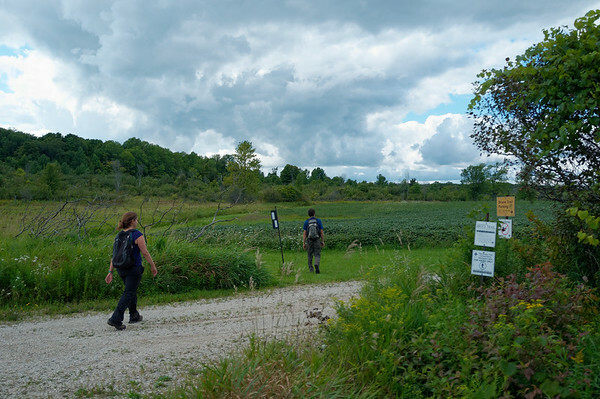 I was quite happy that we were going to finish the part of the Bruce Trail that was leading us south so that we’d be heading in the right direction once again — north! It’s been a while since I’ve had time to post about our hikes but don’t worry, they’re coming fast and furious soon. 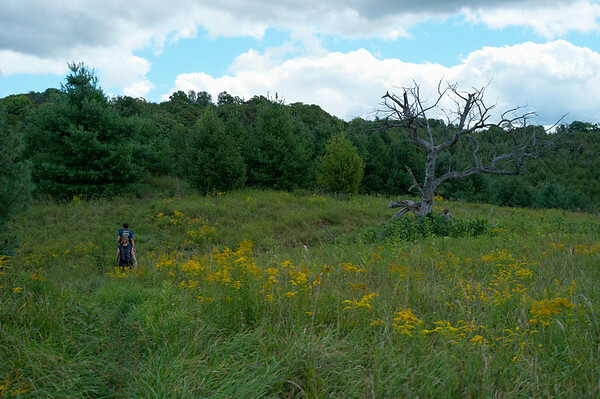 With the big site migration, I’ve had little chance to focus on writing but that’s for another post so here we are during the last week of August with the intention of making some major distance on the Bruce Trail. We managed to get a week off work to make this happen. 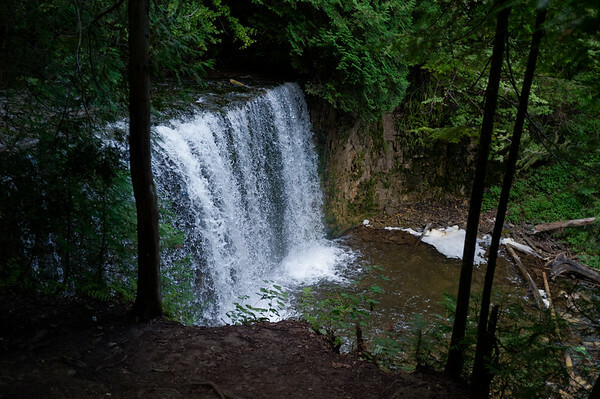 After a very very very very long drive up to the vicinty of Eugenia Falls, we resumed where we left off. Last time, it was very hot and humid and our water shortage left us needing to take a short cut to the parking lot so we made our way back to the waterfalls, climbed over the wall and hopped across the water and got back on the trail. 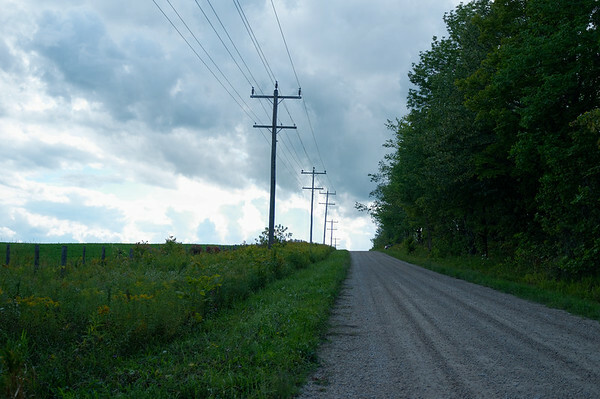 I was quite happy that we were going to finish the part of the Bruce Trail that was leading us south so that we’d be heading in the right direction once again — north! 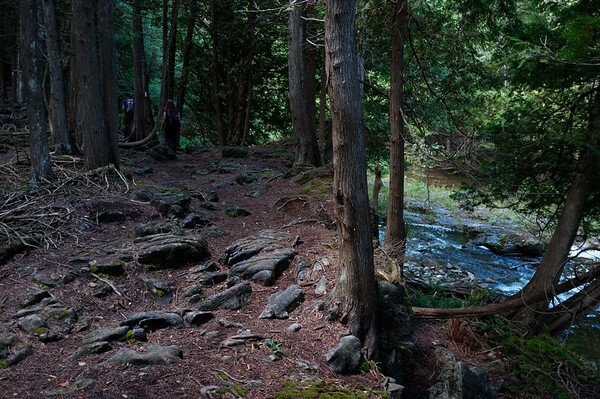 The funny part about this bit of the trail is that it really just takes us in this loop around the river that becomes Eugenia Falls. It was a pretty area and with the relatively cool temperature and lack of bugs, the hike was off to a pretty decent start. 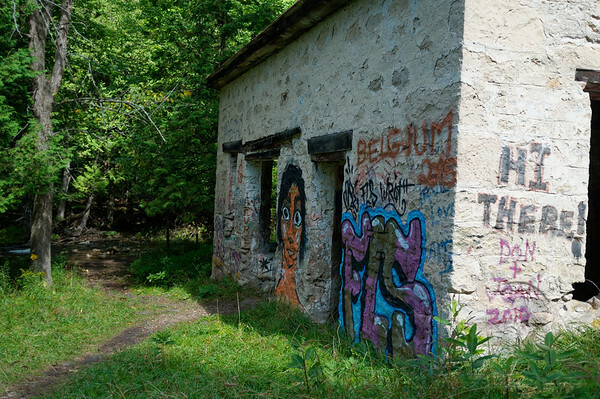 We even ran across some nice graffiti as we passed by what looked to be an old shelter or building. It definitely looked like it was being used as a shelter nowadays. 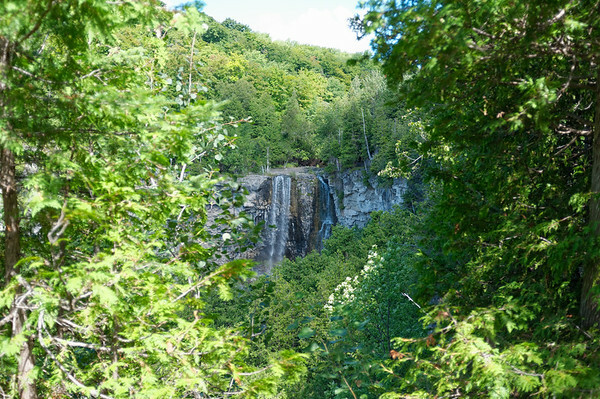 Once we got around the loop, we were provided with some glimpses of Eugenia Falls from a distance. Not very impressive during the summer time but I can imagine it’d be quite a sight in the wetter months with water levels significantly higher. As we progressed along the trail, we found ourselves with some pretty lookout areas. While we were all grumbling about the fact that over the past few hikes, we’d be trekking in the wrong direction (i.e. 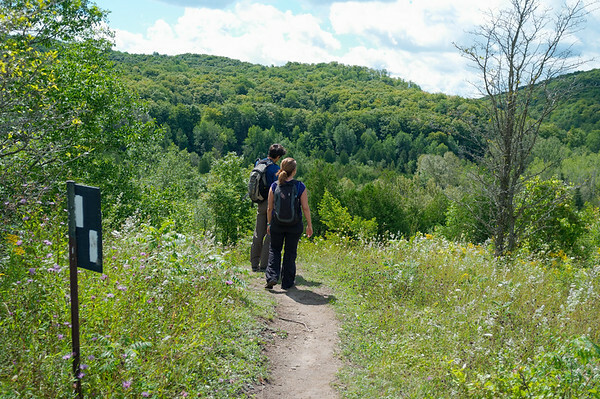 Tobermory is north, not south) — it can’t be denied that the Beaver Valley section is a beautiful and lesser trekked portion of the trail. There are places that I’d imagine would be stunning during the autumn time. I still don’t like the amount of overgrowth on the trail — drives me nuts. Speaking of overgrowth along the trail, we got to wade through a whole lot more tall grass. Don’t get me wrong, I have a problem with it — it’s just not that much fun when everything is triggering your allergies. My friends were even commenting on how strong of a scent the flowers and tall grass pollen gave off. I should stop dwelling on and on about tall grass but it is a recurring issue from my perspective. Regardless, I was always happy once we entered the woods. 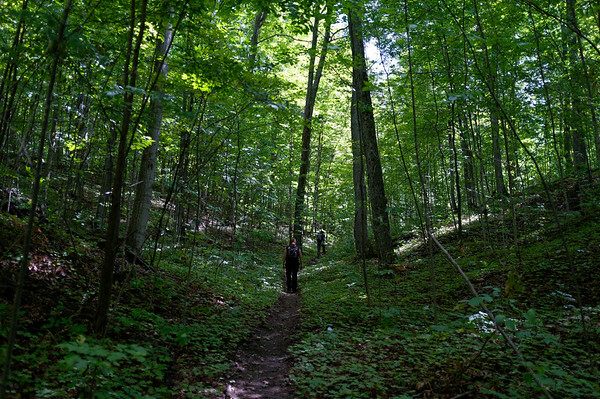 This section of the trail has always provided some really great portions of challenging descents and ascents in the woods because of the valley and the ups and downs of the escarpment. Eventually we reached the beautiful Hoggs Falls that the Boyne River ran through. There were actually quite a few people either passing through or just stopping by (there was a parking lot very close by). We sat down along the side of the river for lunch and just enjoyed the sounds of the river and the falls. I love moments like these on hikes. 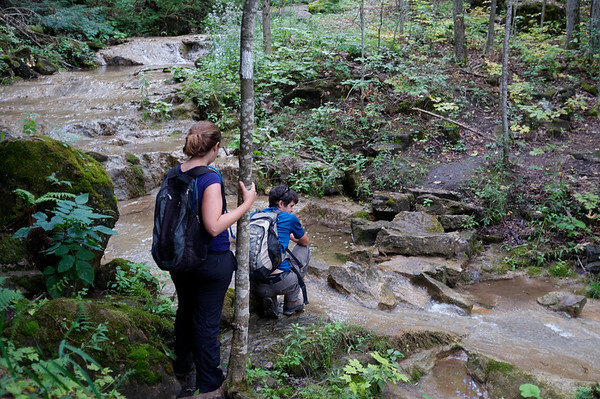 Nothing but you, your friends, and the waterfall … and may be the occasional stranger or fellow hiker. 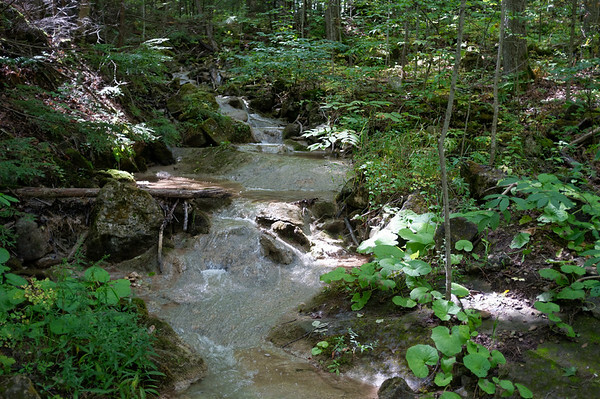 Another really neat feature along the hike that we stumbled upon was a stream with incredibly smooth rocks. Waterfalls are almost always quite a sight (even the dry ones), but streams always intrigue me because I just have to wonder how long they’ve been running that way and how did it begin? Soon we made our way past another lookout point although it wasn’t as impressive as the other ones we encountered along the way. It seemed like this was the point where we were finally leaving the actual valley. 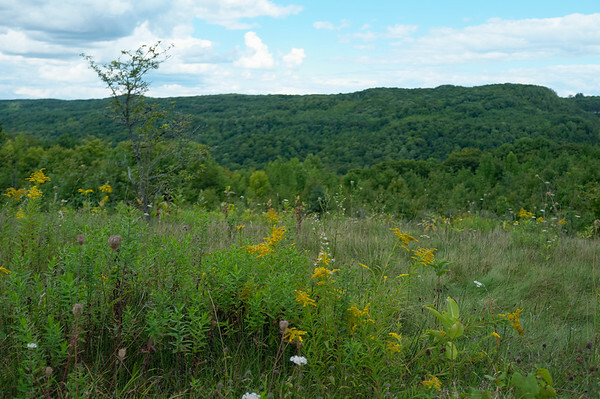 The terrain seemed to be flattening out a little with fewer lookout areas and cliffsides. 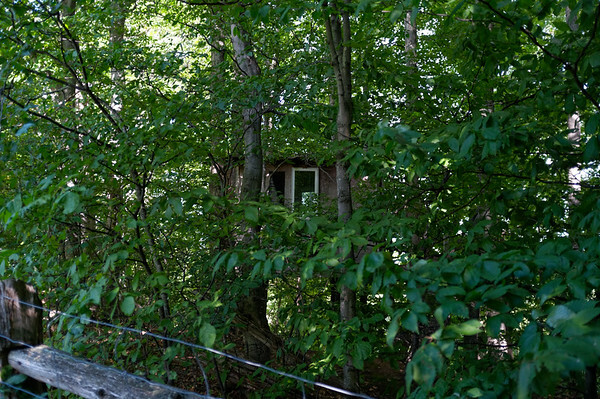 Eventually the trail led us to more fields to cross and we even encountered someone’s treehouse! A little creepy though to have one right next to the trail. 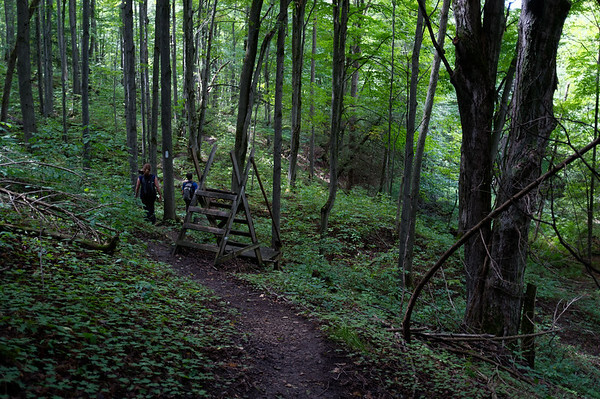 Perhaps there should be treehouses sparsely set up along the whole Bruce Trail — that’d make for a very unique experience, wouldn’t it? As we got further along the trail, despite the cool temperature it felt quite humid so we were happy to stay at the Eugenia Falls Bed and Breakfast for our first night. We stopped at the road and head off to get some dinner and prepare for the next day. 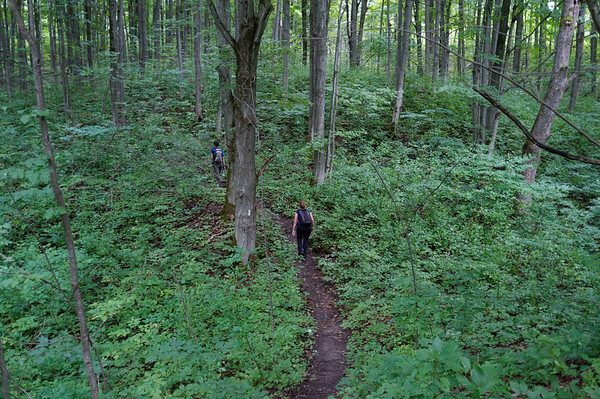 >> View the full gallery from this part of the Bruce Trail.